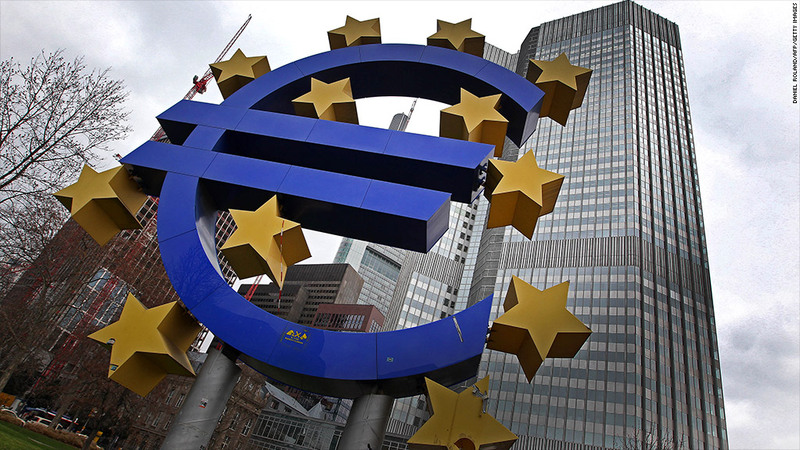 The European Central Bank downgraded its forecast for the eurozone economy Thursday but decided against cutting interest rates to a new record low despite tame inflation, record unemployment and political instability in Italy. The 17-nation currency area economy will contract by 0.5% rather than 0.3% as previously predicted, according to revised projections from the central bank. Eurozone inflation, which fell to 1.8% last month, should average 1.6% this year and 1.3% in 2014. The ECB last cut interest rates, to 0.75%, in July, when the eurozone was in the grips of a sovereign debt crisis that threatened to tear the common currency apart. Since then, the bank has pledged to backstop ailing eurozone countries, and market confidence has returned -- helped by painful economic restructuring introduced by governments in Athens, Rome, Madrid and Lisbon. Only a small minority of economists were predicting a rate cut, arguing that last month's chaotic Italian election and the darkening economic outlook could sway the ECB. President Mario Draghi said the weaker forecast was largely due to the impact of a poor fourth quarter in 2012, and did not reflect a significant change in the bank's view that a gradual recovery should begin in the second half of 2013. Eurozone GDP shrank by 0.6% last year. "We view maintaining price stability in both directions as the best way to support the real economy, job creation and growth," he told reporters. The ECB's stance would remain "accommodative" for as long as necessary and the bank was considering whether it could do anything more to make lenders less risk averse to help the real economy, he added. Italy's protest vote against spending cuts and tax increases left the eurozone's third-largest economy in political deadlock, and showed that market confidence remains fragile. Italian government bond yields shot up after the inconclusive election result, although they have eased back in recent days. "Italy, like all the other countries, should continue on the structural reform path ... and build on the very significant fiscal consolidation it has already achieved," Draghi said. Earlier on Thursday, the Bank of England also shrugged off pressure to inject more cash into the stagnant U.K. economy. It held interest rates at their record low of 0.5%, a level that hasn't changed in four years, and kept its £375 billion bond buying plan unchanged. The world's sixth-largest economy risks falling back into recession for the third time since the financial crisis of 2008 after its gross domestic product shrank by 0.3% in the final quarter of last year. With the U.K. government sticking firmly to a path of austerity, some analysts had expected the bank to provide an additional dose of stimulus this month, despite mixed signals on the health of the economy. Poor growth prospects for the U.K. prompted Moody's to remove its AAA credit rating last month. Government cuts, falling incomes and the eurozone recession are depressing activity. And wages in the U.K. fell faster in real terms than in any other major developed economy between 2007 and 2011, according to a new study. The Bank of England has already bought £375 billion of government bonds, providing a much bigger stimulus relative to the size of the economy than the Federal Reserve's quantitative easing scheme.